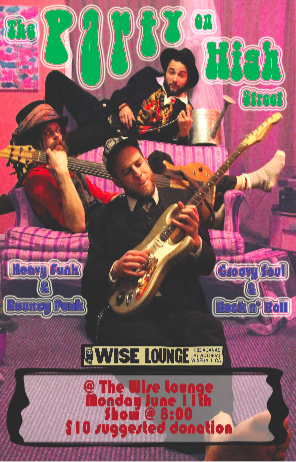 The Party On High Street Plays WISE Lounge in Vancouver!!!!!! Back to our close and comfy stomping grounds to see all our friends and family we have played with for last couple years!! So come on down and lets DANCE! Since finding each other in Nelson, B.C. 10 years ago The Party On High Street has worked tirelessly to bring it’s signature feel-good funk jams to the people! We are a lively dance-inducing mix of funk, folk and jazz fuelled rockn’ roll, joyfully delivered and presented like a funbomb waiting to make you jive. Our band sings of peculiar youthful enchantments, weird love, and some of the odder aspects of life. Touring and playing live shows has fed our spirits and stroked our souls since the beginning. Every summer we travel further into the Canadian festival scene. Playing the campfires and stages, bars and backyards. We’ve developed a family of friends and fellow musicians, who we’ve joined on stage and off for plenty of collaborations and all around good time merry music makin’! We’re taking our new songs and these experiences and recording a full blown electrified funk-rock album, due out Summer 2018!